This entry was posted on Monday, May 2nd, 2016 at 2:42 pm. 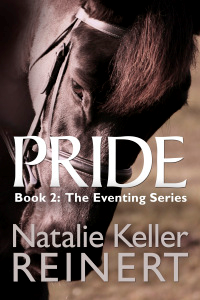 I recently finished Pride by Natalie Keller Reinert, Book 2 in her Eventing Series. As I sat down to write this review, I realized that I never wrote my review on Book 1, Ambition. So, you are about to get two for the price of one! 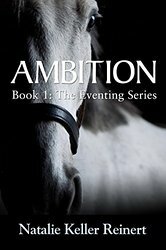 Ambition was published in 2014, and it’s here that we first meet event rider, Jules Thornton. Jules is a little rough around the edges, but she’s more likeable as a character (in my opinion) than Alex of Reinert’s Alex and Alexander series. Jules learned to ride the way most of us poor kids did – she worked her tail off at lesson barns, catering to the rich kids, in order to grab a few lessons for free here and there. Now Jules is grown and out on her own. She has a small farm near Ocala, Florida, where she rides, trains, and competes as much as possible. Life on her own is tough, but she’s making it – just barely. She and her big horse, Dynamo, and have quite a history together, and with the acquisition of a new training prospect, Danger Mouse, aka Mickey, things are looking up for Jules. Also on the horizon though – is a hurricane. (Florida – you sound so wicked. I know winters in Maryland are terrible, but I think I’ll stay up north)! After tragedy strikes, Jules, with the help of newfound flame and fellow eventer, Pete, is faced with two decisions. Toughen up or give up. In Pride, Jules’ story picks up almost immediately where it left off. Now living and training at Pete’s grandmother’s farm in Ocala, Jules is still working with Dynamo and Mickey, hoping that each can make the jump to the next level in their eventing careers. But, as with most trainers trying to go pro, money is becoming scarce for both Jules and Pete, and they begin to worry about losing their hold on the farm. And that’s where the book starts to get really good! Enter Grace Carter, our heroine from Show Barn Blues. In order for both to snag lucrative sponsorship deals, Pete must go to England to work on his cross country skills; Jules, unfortunately for her, must go to Grace’s barn in Orlando to work on her dressage. Jules absolutely abhors this idea, but she knows she must go if it means saving the farm and elevating her career. But her time with Grace is anything but easy. I loved watching the two worlds of both of these books collide! Grace is my favorite out of all of Reinert’s characters, so I was happy to have her back. And while I like Jules too, it was fun watching Grace put the younger girl in her place – ha! I highly recommend all three of these books! You don’t need to read Show Barn Blues first in order to follow along with the Eventing Series, but I would recommend reading it at least before Pride. Enjoy!